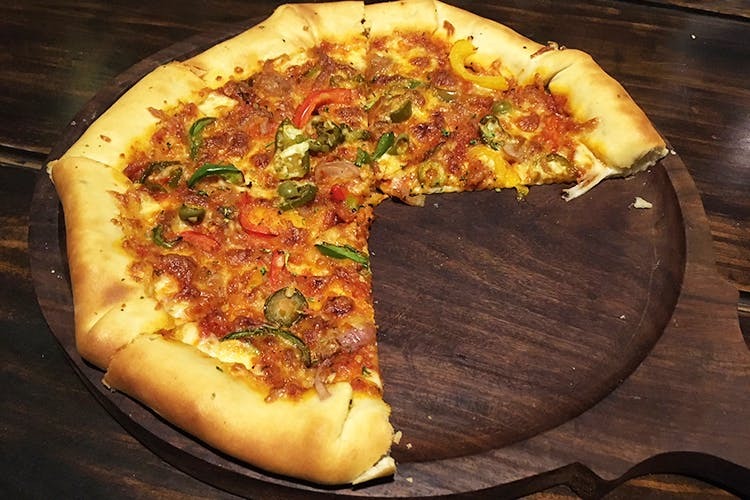 An oasis of great food, dessert and a swish set up in the otherwise humdrum Captain Munshi Layout, Giselle Resto Cafe is a hidden gem worth checking out. Tucked away from Hennur Main Road, it’s easy to miss the obscure Captain Munshi Layout, but once you make your way in, you’ll easily spot Giselle Resto Cafe. A new cafe, this swish space has a nice and easy vibe, with exposed brick walls and pop culture memorabilia. But their al fresco seating space takes the cake, with bamboo, fern and other potted plants dotting the area. Just perch on their big wooden benches, and enjoy. The menu boasts cafe classics, from burgers and wraps to pasta and steaks. We gorged on the Loaded Nachos which were topped with jalapenos, bell peppers, plenty of cheese and generous dollops of sour cream. The nachos were baked in their wood-fired oven and you could taste the difference as these were fresher and crunchier than their store-bought counterparts. With a separate menu dedicated to wood-fired pizzas, we had to try them and zeroed in on the Stuffed Cheese pizza. A little spicy and with a sour twang, the stringy mozzarella cheese stuffed into the crust balanced it all out well. Wanting to end on a sweet note, we flipped over to the dessert menu and opted for The Happy Jar, apparently meant to be a chocolate explosion. When it arrived, we knew we had made a good decision. This OTT dessert jar had a layer of chocolate cake and red velvet cake on the bottom. scoops of chocolate ice cream over it, topped with nuts, Ferrero Rocher, chocolate wafer and finished off with a lavish drizzle of chocolate sauce. Hopefully, the other desserts will live up to this one. We’re planning to tick them off one by one. In fact, skip dinner, and eat dessert here all evening because Giselle looks especially lovely in the evenings when it’s all lit up outside. A great spot for meeting up with your buddies or a casual date, they even have a small performance space inside which means we can expect to catch live music gigs here soon. In any case, Giselle is worth checking out, so head on down to Kacharakanahalli and give it a chance. Fancy Some Pancakes With Live Music? Look No Further!